RGM Introduces Art and Handcraft Watches at WatchTime New York Show — RGM Watch Co. Inspired by art and old-world craft, RGM Watch Company has created men’s and ladies’ watches with art and handcraft as the main theme. The RGM Artwork watches feature the talents of artists from all over the world. Included techniques are Cloisonné, Wood Marquetry, and miniature hand painting, one using luminous paint, and the other performed on a mother of pearl canvas. The Men’s watches highlight the art of Cloisonné and Wood Marquetry. 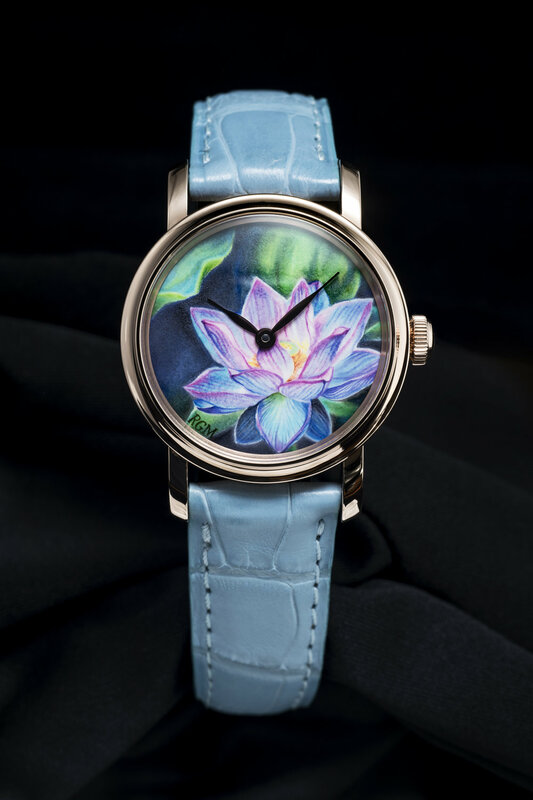 The Cloisonné dial is inspired by Claude Monet’s Regatta at Argenteuil. From St Augustine, Florida, the Castillo de San Marcos is the inspiration for the Wood Marquetry dial. The art on the dial is framed by a 40mm stainless steel coin-edged USA made case, with a Swiss automatic movement fitted with a solid gold winding rotor made by RGM. The Ladies’ watches showcase hand painting in miniature. A lotus flower is portrayed using luminous paint, revealing depth and character to the piece. The other watch features a floral design with a Blue Titmouse painted on mother of pearl, which brings the scene to life. These pieces of art are framed in a 28mm solid rose gold case, or optional stainless-steel case, and are powered by a manual wind Swiss movement. Like our other old-world crafts, Guilloche and Grand Feu enamel, these techniques can also be commissioned in a unique bespoke piece per the client’s wishes. Custom, one-of-a-kind pieces are a hallmark of RGM. These works of art for the wrist continue that tradition.